It is basalt stone warmed at about 45°C and treats whole body using aromatic oil. 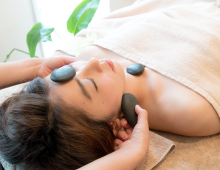 You can relax slowly from the inside of the body by warming muscle tension with hand treatment and warm stone treatment. 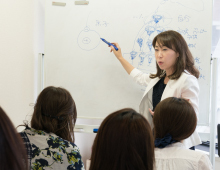 JHSTA practice is an original treatment method that uses hot stones along the body acupuncture and meridians to ﬁt the constitution of the Japanese. I will put all the basalt stone in the whole body point and bring effects to each point as a ﬂame. After treatment, you feel like I got warmed up like body response after entering hot spring slowly. energy, and plus energy is produced. spirit of deep level body. The stone used / recommended by JHSTA is a natural basalt directly imported from Arizona State, USA.This stone contains 57.29% of the silicon (silica) which is now in the topic, and contains many other minerals such as magnesium oxide, potassium oxide, sodium oxide and others.Energy is also high, there is a healing effect, thermal effect, far-infrared effect excellent superior good stone is.In recent years, the hot stone therapy industry, inexpensive stones processed and formed on the market are muddled, but this stone has become a quality that also distinguished functionally by JHSTA's professional. ※ Members offer at special price. Please contact me via email.